Home > Bacteria & the Lungs > What is Psittacosis? Psittacosis is a bacterial infection that affects birds, predominantly parrots, but also other exotic species such as budgies, cockatiels and macaws and more ordinary birds such as ducks, gulls, sparrows, hens. The infection can produce no symptoms or it can be extremely severe, causing septicaemia. This leads to inflammation of the bird’s eyes, breathing problems and bird diarrhoea, but can also produce a variety of other symptoms. When birds are heavily infected, they can pass on the bacterium to other birds and also to humans. Diseases that pass from animals to people are termed zoonoses or zoonotic infections. If someone comes into contact with an infected bird and contracts psittacosis, they may show no symptoms at all, or have a mild illness that is overlooked. Other people start to feel very ill within about two weeks, showing symptoms of pneumonia. During the first week, the psittacosis patient will also have a high fever, diarrhoea, eye infection and bright red spots. The infection can also progress to septicaemia in humans, leading to meningitis, damage to the spleen and a reduction in white cell count. The disease can be fatal if not treated. The causal pathogen in all cases of psittacosis is the bacterium Chlamydia psittaci, which has recently been reclassified as Chlamydophila psittaci to separate it from very similar bacterial pathogens of mammals that cause abortion. These have now been assigned to separate species of Chlamydophila. This small bacterium exists in the environment and in the tissues of birds and infected animals as a spore-like cell. Once inside its host, it becomes intracellular and can only divide actively when inside epithelial cells or macrophages (white blood cells that are part of the immune system). People who own or work with exotic birds are the most at risk. Usually, a pet parrot that has been owned for many years and that is disease-free cannot suddenly develop the disease, or even catch it very easily, but a newly acquired bird might seem healthy and then become ill subsequently. Psittacosis in birds can produce no symptoms when the bird is happy but when it becomes stressed, an underlying infection can erupt. 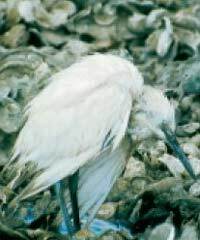 The bird becomes obviously ill and starts to shed bacteria, which can then be transmitted to people. A potential stressor could be a move from one home to another, so bird owners need to be vigilant. Workers in pet shops, vets and workers in the poultry handling and processing industry also occasionally succumb to psittacosis, although the disease is relatively rare. In the USA, fewer than 50 cases of psittacosis have been reported to the health authorities in a decade but those cases that do occur generally create media interest, making the disease appear more of a risk than it is. In 2008, a family of an American man who died from psittacosis in 2006, after he caught the disease from a pet parrot, brought a court case against the pet shop that originally supplied the bird. The decision of blame is a difficult one. As vets point out, the disease in birds can produce no visible signs, or can produce many different signs, depending on the bird. Taking precautions with a new bird and getting medical advice quickly if it starts to become ill is the only way to avoid psittacosis. The rarity of the infection in humans often leads to it being misdiagnosed and therefore potentially mistreated. The most effective antibiotics are doxycycline or tetracycline given for at least 14 days after the fever subsides. In very severe cases of pneumonia, intravenous antibiotic therapy and supportive care in hospital may become necessary.